This is a new attempt on the part of Facebook to make the user experience ever more unique and interesting. Facebook Places are sort of a mash-up of Google Places, Bing or Yahoo Local and Foursquare. They allow users to “Check In” like Foursquare, as well as allow business to offer “deals” to customers who “Check In”. They also show your location on a map, and allow you to add a photo and other information. Facebook Places asks you to “CLAIM” your listing, just like Google Places. We recommend that you CLAIM the Place Page. We advise caution, however, with MERGING the Place Page with your Business Fan Page. IE: We do NOT recommend you Merge your Place Page with your Business Fan Page at this time. These are two different steps, which lead to different scenarios. 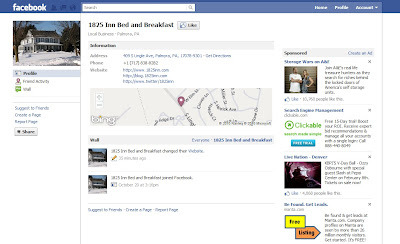 If you CLAIM your Facebook Places, you will be able to add a photo and other content, and you’ll have control over it. If you MERGE your Facebook Places with your business page, your application tabs will go away from the top of the screen, to now be clickable links below your left hand column image. This includes any application tabs connected to customized content IE: Landing pages, reservation tabs, specials tabs, etc. Your Place Page contents (The Map) will also be in a fixed location at the top of your wall. Also, as part of a MERGED Listing, should you currently have a Customized Landing Page, new visitors will no longer “Land” on the custom content when they access your Business Fan page as the currently do today. The option to redirect new visitors to a landing page is not available as part of a MERGE as it stands currently. Side Note: If you have Customized Pages, they are NOT GOING AWAY, but should you Merge your Place Listing with your Fan page, (which again WE DO NOT RECOMMEND) how a visitor accesses these pages will change from Application Tabs across the top of the screen, to links below your image in the left hand column. You can CLAIM without MERGING – see the video to learn how. This is great information for anyone just starting with their Facebook Fan Page. We did merge our pages and now it is for lack of a better word, challenging. You definitely have less options for individual customizing. Although we are getting much more traffic to it. I am now wondering, could you start another Fan Page? I wouldn't recommenend starting a new page. Your current page is working for you. Great step-by-step video! Problem is, no map tab for our business to claim. What now?